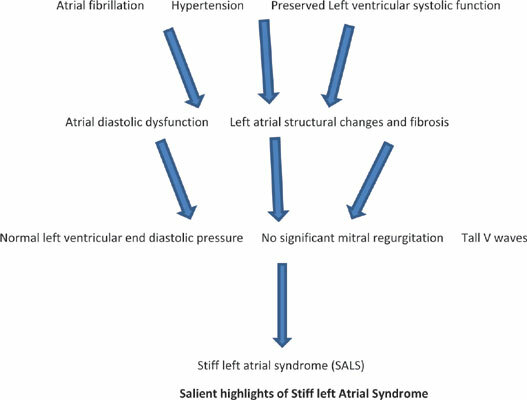 Objectives: Stiff left atrial syndrome is an intriguing clinical phenomena characterized by reduced left atrial compliance, pulmonary venous hypertension and exacerbations of volume overload. We conducted a retrospective review of patients diagnosed with stiff left atrial syndrome at our center. Methods: All patients admitted to our hospital with volume overload and pulmonary venous hypertension who were diagnosed with stiff left atrial syndrome based on evidence by echocardiogram and right heart catheterization between July 2011 and July 2013 were included in this retrospective review. Results: Twentythree patients (mean age 73 ± 11 years, 39% male and 61% female) were diagnosed with stiff left atrial syndrome at our center. Thirty-five percent had persistent while 39% had permanent atrial fibrillation. Mean duration of atrial fibrillation was 7.6 ± 2.1 years. Forty-three percent of patients had long standing hypertension. There was no mitral regurgitation in 39% of patients while 48% had mild mitral regurgitation. On right heart catheterization, mean right atrial pressure was 12.6±4.8 mm of Hg, mean pulmonary arterial pressure was 33±7.2 mm of Hg, mean pulmonary capillary wedge pressure was 24.8± 4.2mm of Hg while peak V waves were seen at mean of 37.8± 5.3 mm of Hg. Mean left atrial volume index was 49.8±17.1 mL/m 2. After the initial diagnosis with a two year follow- up, there were no readmissions in 65% of patients who were on appropriate diuretic therapy and had regular clinical visits. Frequent readmissions were seen in 35% of patients inspite of appropriate diuretic therapy. All-cause mortality rate was 4.3% at two year follow up. Conclusion: In patients with stiff left atrial syndrome, the presence of left atrial dilation, long standing atrial fibrillation and hypertension are the key factors associated with pathogenesis and clinical course. Close follow up and monitoring of volume status is essential to prevent hospital readmissions and improve long term prognosis. Stiff left atrial syndrome, prospects, Restrospective analysis, hypertension, echocardiogram, right heart catheterization.